Without missing a beat from issue #987's reveal, Superman insists that Oz is lying. Kelex runs a scan and finds Oz is truly Jor-El. Still skeptical, Kal digs for answers regarding his father's survival of Krypton's destruction. Jor-El uses the crystals in the Fortress to show his son what happened in the days before the death of their world. The story plays out as normal, but continues after Kal's ship left the planet. Apparently, as Krypton was dying, a mysterious force rescued Jor-El and sent him to a war ravaged country on Earth. There, he was taken in and given shelter by a family struggling to survive during a murderous rebel gang's reign of terror. When the gang cuts off food supplies for the innocent villagers, Jor-El is asked by the family to leave. Feeling he owes the family for their kindness, he sneaks into the gang's camp and steals food for them. Unfortunately, one of the children in the family reveals the existence of the refugee hiding in his home to gain favor with the warlord. The family is attacked and the child is forced to murder his family. Enraged, Jor-El lets loose a stream of heat vision, mowing down the wicked men. He is once again taken by a mysterious force and shown the wickedness of man and the horrors of the past. Superman argues that not all humans are wicked - that mankind has a great capacity for good. Jor-El insists that man doesn't deserve to be saved and tells his son that he'll be taking him away from Earth. Story - 4: Now we're cooking with fire! Right off the bat, Superman says what everyone is thinking. I still don't fully believe that Oz is Jor-El, but his story slightly swayed me. It's pretty convincing as far as comic book explanations go. The mysterious force Jor-El speaks of could be anyone, especially since there are new players in the DCU capable of that sort of thing. It's even more possible for something to have happened since the crystals only had information of the planet up to the moment that the ship left. Then again, Superman has been tricked before. He's been deceived by Mr. Mxyzptlk when the 5th dimensional imp pretended to be Clark Kent. Even the technology in the Fortress couldn't tell that fake Clark was an imposter. Kelex runs a DNA, retina, and voice scan on Jor-El, but I'm sure there are ways to fake those things in this universe. I mean, Superman was recently fooled by Clayface when he took the form of Batman down to his heartbeat over in Dark Knights Metal #2. Something's fishy here, but for now, let's see where things go. Regardless of whether I believe Oz is truly Jor-El, this issue is very good. Jurgens tells a story that both makes you want to believe Jor-El and also understand where he's coming from when he says mankind is rotten to the core. Like a good issue of an ongoing title should, I'm left eagerly anticipating the next issue. Art - 5: Much like the writing, this is also a great improvement over last issue. Although I would have liked to have seen more Bogdanovic artwork to keep things visually consistent on this story, Sook's art is always welcomed. There are some wonderful images present here and, although I adore Bogdanovic's work, I feel like Sook is the artist that should finish up a story like this. His work seems to fit better with the content. Cover Art - 4: This cover is tragically beautiful. Seeing Kal's parents destroyed with the tilting of the book is heartbreaking. 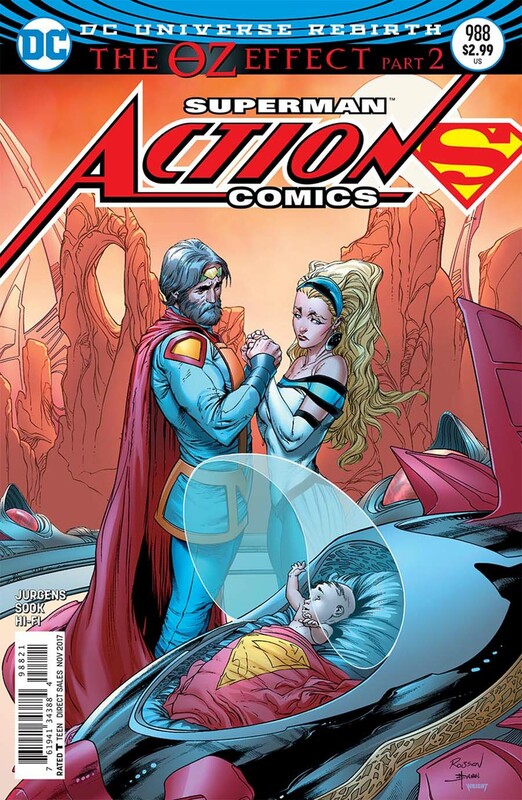 Even the non-lenticular cover depicting Jor-El and Lara saying goodbye to their child is fantastic. 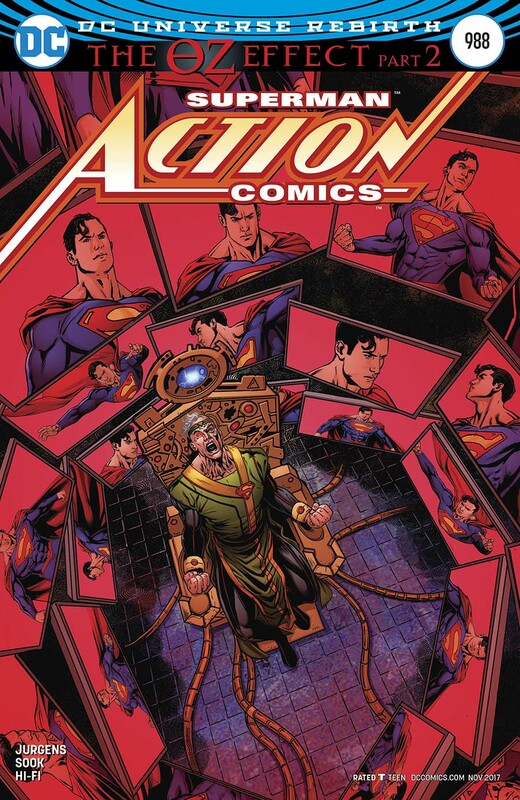 Variant Cover Art - 3: The variant for this book is well-drawn and certainly looks cool with Jor-El strapped to a chair and surrounded by images of Superman, but I just happen to prefer the standard cover.